Go for gold and release the X-factor within you with new Xcite, the guarana energy cider with attitude. The new gold standard for ciders, Xcite Energy Cider is made with 100% locally grown and pressed golden delicious apples and guarana fruit extract for a crisp, refreshing taste and a sassy burst of energy. 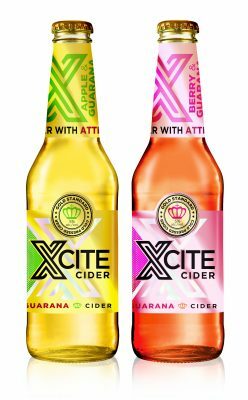 Strutting her stuff with two juicy flavours, Apple & Guarana and Berry & Guarana, new Xcite Energy Cider has that vivacious sparkle that stands out in a crowd. It gives you a fabulous energy boost to stay on-trend, whether you are out with your girls, on a date with your significant other or just having fun in the sun. As your passport to glamour, new Xcite is well balanced with an alcohol content of 5%. It comes in stylish shimmering 275ml glass bottles and 440ml cans; and will take you to the next level with vibrant, uplifting energy. Look out for new Xcite Energy Cider at chic city hang-outs, bars and restaurants. You can also find it at leading stores retailing at around R14.99 per bottle and R16.99 per can.